Floorplanner is an intuitive, web-based room design application for interior designers, homeowners, and real estate agents. It’s an easy-to-use solution that allows all including novice architects to design optimized office developments and lavishly decorated homes. The software utilizes flash programming technology and provides multiple options for wall coverings, flooring, objects and furniture to allow users to come up with interactive floor plans and share designs with clients online. It enables users to leverage graphical props and perfect measurements to determine the precise floor space they need to achieve their goals. The ability to view room designs in 3D and the great tutorials offered by Floorplanner make it one of the best free online room design tool. Some of the salient features offered by this application include 3D render, High-res images, branding, a library of objects, iPad/iPhone app, and export to PDF. Floorplanner is a cloud-based room design software which means you don’t have to download and install the program to use it. You just sign up for an online account and start designing almost instantly without leaving the web browser. It works perfectly on any device and offers a flat learning curve with great tutorials to hold your hands when things go haywire. One of its strength is the intuitive editor. The editor allows you to create your first-floor plan in minutes to give your office, homes, or restaurant a clear view. Once the floor plan is ready, Floorplanner allows you to play around with the interiors to come up with beautifully decorated designs. The solution has one of the biggest libraries of furniture icons that can be used in the design. It also allows you to enter dimensions or adjust measurements by clicking and dragging to make the aspects bigger or small. Better still, you can copy and paste furniture or drag them around using the mouse. Additionally, Floorplanner allows you to create a design of your home or office and display them from an overhead view. It also renders all projects including prop additions and other changes in 3D thereby giving your design more life. However, to view the prop additions and changes in 3D you will have to make them in 2D first. You can easily switch between 2D and 3D to see how the changes would appear from a real situation. 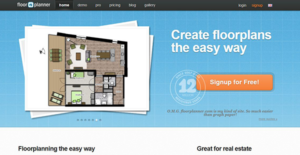 Floorplanner allows you to share or print your designs across multiple social media platforms. It supports sharing of projects via Facebook, direct email, Twitter, and embedding into your website. This permits you to connect with your clients wherever they are and share details of the project with ease. If you are interested in Floorplanner it may also be beneficial to check out other subcategories of Best Architecture Software gathered in our database of B2B software reviews. Each enterprise has its own characteristics, and may call for a special Architecture Software solution that will be adjusted to their company size, type of clients and employees and even specific industry they deal with. We advise you don't count on locating an ideal app that will work for every company regardless of their history is. It may be a good idea to read a few Floorplanner reviews first and even then you should keep in mind what the service is supposed to do for your business and your workers. Do you require an easy and straightforward solution with only essential functions? Will you actually make use of the advanced functionalities needed by experts and large enterprises? Are there any particular features that are especially practical for the industry you work in? If you ask yourself these questions it is going to be much easier to locate a solid solution that will fit your budget. How Much Does Floorplanner Cost? We realize that when you make a decision to buy Architecture Software it’s important not only to see how experts evaluate it in their reviews, but also to find out if the real people and companies that buy it are actually satisfied with the product. That’s why we’ve created our behavior-based Customer Satisfaction Algorithm™ that gathers customer reviews, comments and Floorplanner reviews across a wide range of social media sites. The data is then presented in an easy to digest form showing how many people had positive and negative experience with Floorplanner. With that information at hand you should be equipped to make an informed buying decision that you won’t regret. What are Floorplanner pricing details? What integrations are available for Floorplanner? If you need more information about Floorplanner or you simply have a question let us know what you need and we’ll forward your request directly to the vendor.